That should blow the lid wide open on the way that the planet's élites screw over the rest of us! Well done, BBC! Here we learn of a Monaco-based firm which has been systenatically bent on a global scale for close on two decades, corrupting companies and governments and bribing officials worldwide. A big story, you might think. And you'd be right. It's a huge story. So why - especially bearing in mind that, by last weekend, criminal investigations had been launched by the police forces of three major democracies (well OK, the US, the UK and Australia), and that the headquarters of Unaoil in Monaco had been raided - is this the outcome even a full week on from those actions when you search for 'Unaoil' on the BBC News website? Curious. But I wonder if there's a clue lurking within the stories themselves, boys and girls? "The data contains secret offshore companies linked to the families and associates of Egypt's former president Hosni Mubarak..."
"...Libya's former leader Muammar Gaddafi..."
"...and Syria's president Bashar al-Assad." "It also reveals a suspected billion-dollar money laundering ring that was run by a Russian bank and involved close associates of President Putin." "Mossack Fonseca data also shows how Icelandic Prime Minister Sigmundur Gunnlaugsson had an undeclared interest in his country's bailed-out banks." This is presumably included as a little slap to Iceland for having the temerity to jail their bent bankers, as opposed to the established practice in truly free countries of putting them in the legislature. 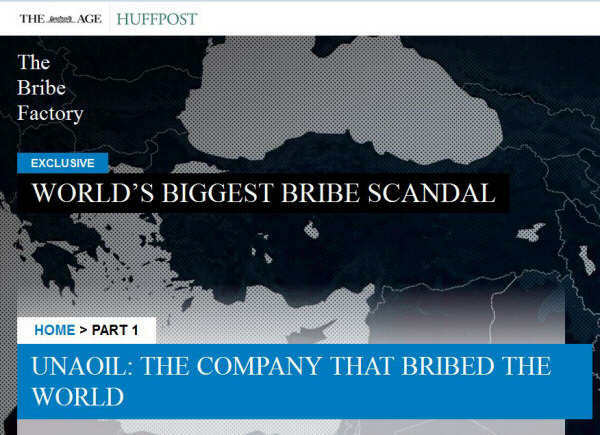 "...the true extent of corruption within the oil industry, implicating dozens of leading companies, bureaucrats and politicians in a sophisticated global web of bribery and graft." "Fairfax Media and The Huffington Post can reveal that billions of dollars of government contracts were awarded as the direct result of bribes paid on behalf of firms including..."
Erm, hasn't the weather been nice this weekend? Quick! Has anyone got an amusing picture of a kitten to show people? "...and Korean heavyweights Samsung and Hyundai." What? Not even of a dead kitten? Oh, look! A squirrel! "The trove reveals how [the Ahsani family, who own Unaoil] rub shoulders with royalty, party in style, mock anti-corruption agencies and operate a secret network of fixers and middlemen throughout the world's oil producing nations." "Bankers in New York and London have facilitated Unaoil's money laundering, while the Ahsanis have built a major property investment business in central London." Perhaps we have now stumbled upon the reason why the BBC hasn't so much as breathed a word about this story. It has become well enough established by now, especially post-Hutton, that the BBC is no longer merely the Establishment broadcaster, it is the state broadcaster. No-one who saw its coverage of the referendum in Scotland, no-one who has seen the way that programmes bearing titles including the phrase "The Great British..." have spread like bindweed over the schedules, no-one who has had to watch Marr, Robinson and Kuenssberg droolingly interviewing the élite down the years, could be in any doubt that the BBC's journalistic agenda is now set elsewhere, and for purposes of obfuscation and distraction from inconvenient realities rather than anything which could genuinely be described as 'investigative journalism'. And so, through the persistent complaisance - or outright cowardice - of those charged with running it, the BBC (which long had its virtues, remember) is holed again and again below the waterline, to sink into oblivion. Footnote: That both the Grundiad and the Binned-dependent are both puffing the Panama story as well now should confirm our suspicions.